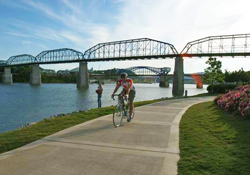 Chattanooga, Tenn., combines small town amenities, such as walkability and easy navigation, with big-city attractions like the Tennessee Aquarium and Rock City. A little less than two hours from downtown Atlanta, Chattanooga is full of food, activities and adventures for families. With weekly summer events like the Chattanooga Market (Sundays), Chattanooga River Market (Saturdays) and the Nightfall music series (Friday), there&apos;s certainly plenty to do. "There&apos;s always something happening. 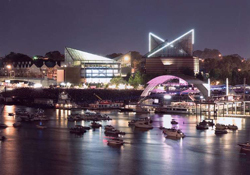 Visitors can enjoy annual events, live music and entertainment, outdoor adventures to anytime fun at the attractions," said Candace Davis, marketing and public relations manager at the Chattanooga Area Convention and Visitors Bureau. "Nobody will be bored here." Here are seven reasons why you will love exploring Chattanooga with kids. Whether you&apos;re looking for a quick lunch, a gourmet version of your kids&apos; favorites, a locally owned sit-down restaurant or a sweet spot for dessert, Chattanooga has got you covered. Start or end your day with Julie Darling Donuts, one of many restaurants located on Frazier Avenue in downtown Chattanooga. Head to Good Dog, also on Frazier Avenue, for gourmet hot dogs or Lupi&apos;s Pizza on Broad Street for handmade pizza with locally sourced ingredients. Local produce and meats also are on the menu at the Public House at Warehouse Row, which offers fine dining in a relaxed setting, plus a kids&apos; menu. Cool off at the end of a summer day with frozen desserts, such as The Ice Cream Show. With options like High Point Climbing, the Jump Park Trampoline Center and the Creative Discovery Museum, it&apos;s easy to find fun in Chattanooga. Kids and parents can jump by the hour at the 18,000-square-foot Jump Park, which also has games and food. 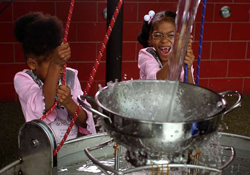 The Creative Discovery Museum is a playful learning environment where kids can dig for dinosaur bones in the Excavation Station, get creative in the artist&apos;s studio or climb the two-and-a-half story RiverPlay structure. There is also a PlayGym for kids under 3 years old. Or you can spend an afternoon at Lake Winnie Amusement Park, located just outside of Chattanooga and open from April-October. The park has kiddie attractions, family rides and thrill rides, including the brand new Twister thriller, to make sure any age kid has fun. Its SOAKya Water Park includes water slides, a crazy river and more activities. 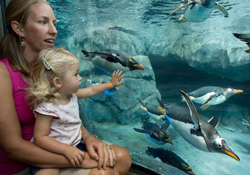 Explore the depths of the ocean, animals from all over the world or the history of the city, all in Chattanooga at the Tennessee Aquarium, Chattanooga Zoo or through the Chattanooga Ducks city tours. At the aquarium, your kids can touch and feed Aquarium animals with a backstage pass, take a ride on the River Gorge Explorer boat or step into the butterfly gardens. The zoo has over 300 animals representing 130 species. On the Chattanooga Ducks tours, which start at the corner of 5th and Market Streets, visitors ride amphibious vehicles built for World War II that start out on dry land and then splash into the Tennessee River. The Southern Belle Riverboat offers daily lunch, dinner and sightseeing cruises. Or if you feel like diving into the depths of the earth, instead, you can take a guided tour the Raccoon Mountain Caves or Ruby Falls, which is a 145-foot thundering waterfall located more than 1,120 feet beneath Lookout Mountain. One of the Southeast&apos;s most unique lodging accommodations is the Chattanooga Choo Choo Hotel, where you can spend the night in former train cars. A variety of hotel chains have locations in downtown Chattanooga, such as Holiday Inn and Suites, Hilton Garden Inn, and Hampton Inn and Suites. One tip is to ask about package deals with attraction tickets. If your little ones are eight and older and you&apos;re feeling something a little quainter, bed and breakfast options include the Chanticleer Inn. There you can get homemade breakfast in the morning and dessert at night, plus have access to the inn&apos;s pool. A trip to Chattanooga doesn&apos;t have to break the bank. Tickets to the Chattanooga Zoo, where you can see snow leopards, capybaras and Chinese alligators, are $8.95 for adults and $5.95 for children. When you are downtown, walk this loop with the kids. 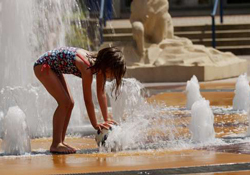 Start at The Passage, a cascading water feature that links the Tennessee Aquarium plaza with the downtown riverfront. Then walk across Walnut Street Pedestrian Bridge to the NorthShore neighborhood, which is home to Coolidge Park. It’s one of the city’s largest parks and a free place to let the kids run off some steam, with an interactive water fountain and plenty of green space, along with rides on the restored antique carousel for just $1. After the park, Davis suggests getting ice cream at Clumpies Ice Cream, a local favorite, and then circling back to the south riverfront and The Passage. If you&apos;ve got sports fans in the family, check out the Chattanooga Lookouts minor league baseball games at AT&T Field. Tickets range from $3-$9, and kids can run the bases after home games. Look at the 2016 schedule to make sure there&apos;s a game during your visit. 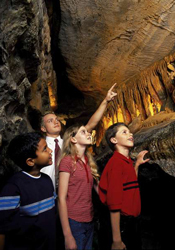 Additionally, many attractions offer bundles, like the Double and Triple Play Combination tickets at Ruby Falls, which include Ruby Falls and Rock City, or Ruby Falls, Rock City and the Incline Railway. You can also check out these family fun vacation packages. Chattanooga&apos;s small town feel means you can feel more comfortable with your family when you&apos;re moving through the city, plus the readily available public transportation means that you don&apos;t have to walk unfamiliar streets. Because Chattanooga is a fairly small city, with a population of almost 200,000, and it has a bustling tourist economy, the amount of people on the streets strikes a balance between deserted and too crowded. "It seems like a big city, but the streets aren&apos;t overcrowded," said Davis. "You can walk around, and you do feel safe." From Atlanta, take I-75 north to reach Chattanooga, which is just over the Georgia-Tennessee border. If you stay on the riverfront or near downtown, ditch the car and walk. With CARTA&apos;s Downtown Electric Shuttle, which is free, and the Bike Chattanooga bike share, there&apos;s no reason to bother with parking. Electric buses run daily from the Chattanooga Choo-Choo, where you can stay at the hotel, shop, eat or explore the rose gardens, to the Tennessee Aquarium, and the ride is free. The bike share, ideal for families with teens — they don&apos;t have kiddie bikes — has over 30 stations, and costs $8 for 24 hours or $15 for three days. And if you ever get lost? 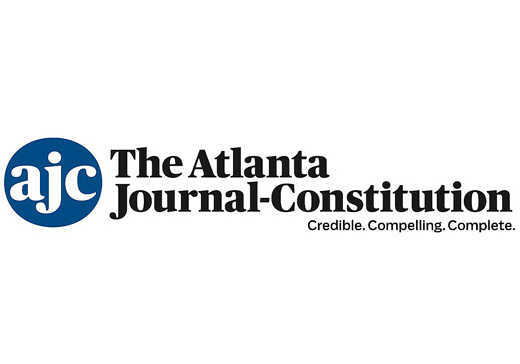 "All roads lead to the Tennessee Aquarium and riverfront," said Davis. Plus the Chattanooga Visitors Center (215 Broad St.) is available for anyone who needs help navigating the city. Read online here or view as a PDF.